Her works also are an invitation to wander into the contrasted musicality of her inner scenery made of radiant shadows and fuzzy lightness, and perceive beneath the seemingly continuity of her painting topics, the relentless pursuit of an artist “...searching from her inner-self, that unforeseeable way...” through the ultimate expression of her art. 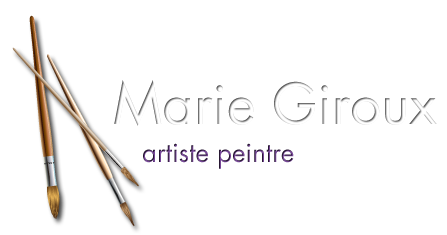 Very committed in her artistic community, Marie Giroux is a self-taught painter, who grew up in a most creative family. Her appeal for plastic arts eventually brought her to attend the Norman Hudon's Studio, in Montreal (1971-1973), and later develop her oil painting techniques with some renowned painters, up to the point where she decided, in 1988, to set herself up as a professional artist.